Pope Francis greets the crowd during his Easter message and blessing “urbi et orbi” (to the city and the world) delivered from the central balcony of St. Peter’s Basilica at the Vatican on 1 April. Perhaps because I was adopted, my sense of family was always as widened — almost as though “family” was those I learned to love and those who loved and nurtured me, especially my church family. That CNEWA carries an outstanding credential, as a relief organization associated with the Holy Father, there can be no doubt. Certainly, to participate in CNEWA‘s programs for children in the Middle East is a blessing and can have long-lasting, positive consequences. In my own experience, assisting children in Ethiopia through CNEWA was an inspiration to take the further step and adopt children from overseas. When I lost one of my biological children in an auto accident, having considered adoption previously led to my active pursuit of an adoption from India. My acquaintance with other adoptive parents during the process easily lead to a second adoption, in this case, from China. Without question, the adoptions of my two daughters were some of the signal events of a lifetime. Now in their 20’s, they have been nothing but blessings to one another and to our family. I will forever be grateful to CNEWA for the opportunities it has afforded me, including the inspiration to adopt two of my children. Our president, Msgr. John E. Kozar, often likes to refer to the work we do — whether that’s in the field overseas or here in the United States meeting with friends and supporters — as a matter of caring for our one “CNEWA family.” We’re grateful to consider Malcolm Donalson and his own as part of that big family. If you’d like to support our children-in-need programs, and be a part of the CNEWA family, you can do so by visiting this link. Thank you! According to tradition, Christianity’s presence in India dates to the arrival of the Apostle Thomas in the first century in what is now Kerala. Today, in the hearts and minds of aspiring priests and many others throughout the state, visitors catch a glimpse of a church to come — one no less driven and hopeful than it was in those first days. On a warm and humid February morning, a few men gather at St. Francis Theological College in Thellakom, a tiny village in Kerala. Seated in the library, the men — Brothers Abhilash Elamthuruthil, Nelson Verghese, Arun Elavumkal, Nishad Sebastian, Manoj Sebastian and Michael Thomas — discuss their call to serve the church as members of religious communities. Brother Abhilash says he was inspired by reading a biography of St. Francis of Assisi while in secondary school. Brother Nelson says his experience as an altar server in his parish in a village in northern Kerala helped him realize his calling. “I believe I can work with people. That’s my charism. Capuchins aren’t limited to a parish. We work in the community, ready when required,” he says. Read more. And check out the video below. 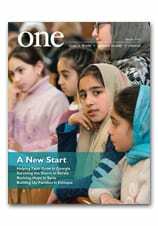 The March 2018 edition of ONE is now available online and is headed to your mailbox — just in time for Easter! This edition focuses on formation, and there’s a rich collection of articles and images that help tell the story of how CNEWA is working to form faithful Christians in some of the most challenged and challenging parts of the world. You will meet young Ethiopian sisters preparing to become leaders of their communities; you will hear from seminarians in India, describing their vocation journey; and you will be introduced to a a group of religious sisters in Jordan who are enriching the lives of the laity, many of whom are refugees. Visit our digital edition to read more. And be sure to check out Msgr. Kozar’s preview below. Sister Hanne Saad passes out sweets at an Iraqi youth group meeting in Jordan. Learn how the Franciscan Missionaries of Mary are Inspiring the Faithful in Jordan in the new edition of ONE. Students play during a break at the Abba Pascal Catholic Girls’ School in Soddo, Ethiopia. Learn why Catholic schools in the country are considered the Head of the Class in the June 2017 edition of ONE.